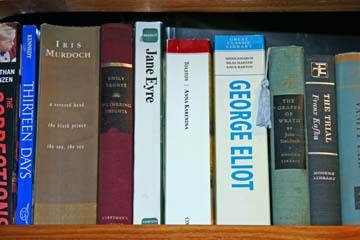 Today's photo will allow you to browse the rest of the main collection. 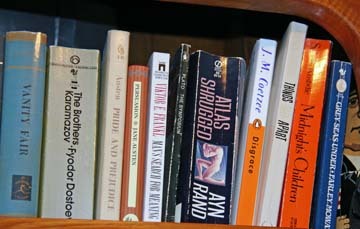 Additional books on board that are not pictured are manuals, more novels, and Spanish and French dictionaries and tutorials. 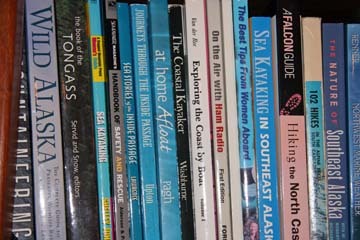 The sea kayaking and Southeast Alaska books are linked in the left-hand column. 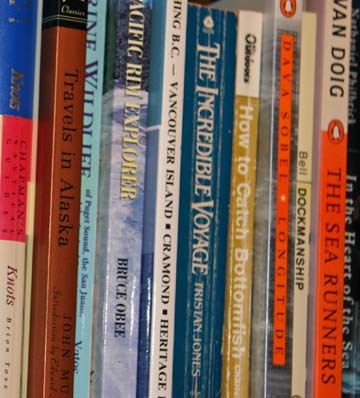 Books about sea kayaking and Southeast Alaska are listed and linked over in the left-hand column, but today's and tomorrow's photos will allow you to browse the wider selection. Here is today's installment. At the height of summer, the sun rises at approximately 4 a.m. and sets at approximately 9:30 p.m. Light makes an appearance before the sun is up, and hangs around after it slips below the horizon. For more details about the duration of daylight anywhere in Alaska, check out Alaska.com. 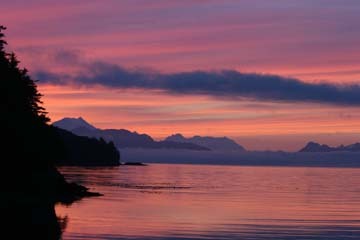 Your friendly blogger is a morning person who was not awake to witness this sunset near Pelican, Alaska. Fortunately our night owl knew how to operate the camera. What About Bears in Southast Alaska? There are a lot of bears in Southeast Alaska, and they are a joy to watch. Black bears are fairly abundant on the southern islands. Brown bears, or grizzlies, predominantly inhabit the mainland and Admiralty, Baranof and Chichagof Islands in the north. 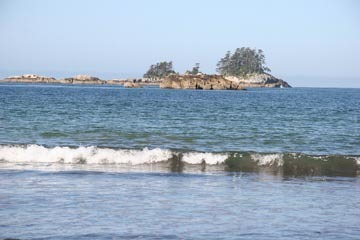 Watching bears that are on the beach while you are in the kayak or on board the mothership is easy; all you have to do is keep a safe and respectful distance. Hiking in bear country has a few more rules, most of which are meant to keep you from surprising or crowding any bears that you encounter. 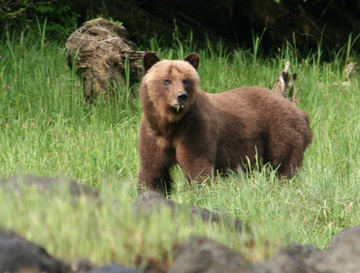 For more information, see the Tongass Forest Service's "Bear Facts". Then, cross your fingers and hope that you get to see one or more bears while you are here. 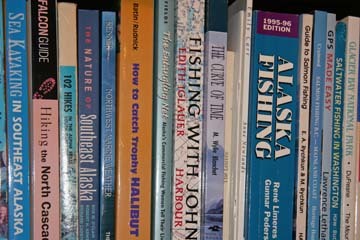 What About Tides in Southeast Alaska? The tides in Southeast Alaska range from -4 to +20 feet. This can make camping difficult. It also sets up hazards such as whirlpools and rapids in narrow passages. Fortunately, tides are predictable and can be taken into account - sometimes to great advantage. On board the mothership, kayakers will have the navigational tools and programs necessary to plan the best routes to avoid or take advantage of currents. And hikers? Remember that what goes out must come back in! What is the Weather in Southeast Alaska? 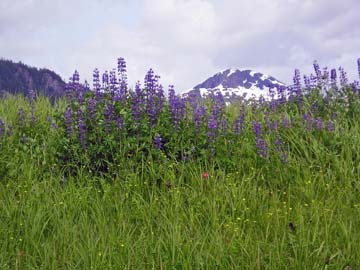 Summer weather in Southeast Alaska is variable, and it is wise to prepare for rain or shine. Annual precipitation ranges from 30" around Skagway up to about 160" in the Ketchikan area. About half of the precipitation falls from September through December. Storms usually blow out of the southeast. Winds of 30 knots are common, and storm winds can be 50 knots or more. The driest months tend to be June through August, although May in the last couple of years has been fantastically fair. August can be foggy. Any summer day can be sunny and hot. Northerly winds usually bring fair weather, but still can send 20 knots of wind, usually in the afternoon. The best idea is to come prepared for an adventure that might include rain, sun, wind or fog - or all of the above. Dressing in layers allows you to adjust to current conditions. Kayakers, of course, have to protect themselves against the very cold waters, whatever the air temperature. There may be days when the weather keeps everyone close to, if not on board, the mothership. Such days are good for photographing wildlife and weather, writing postcards, keeping company with a good book and hot tea or, if you purchased a license and put on one of our big raincoats, dropping a hook or a trap for the catch of the day. 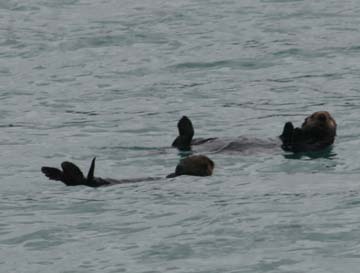 Take it from these guys, the weather is part of the fun in Southeast Alaska! The surface of snow and ice reflects all light, without any particular preference for color of the spectrum, but the interior handles light differently. Snow acts as a light filter, and treats the spectrum preferentially, scattering red light more strongly than blue. Photons emerging from snow and ice generally have more blue rays than red. The deeper the snow and ice, the farther the light must travel, and the darker blue it becomes, just as water appears a deeper blue as it increases in depth. 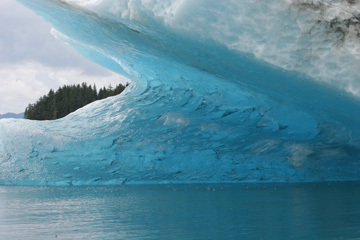 For this reason the deep crevasses in the glaciers [and icebergs] possess an unearthly azure blue. 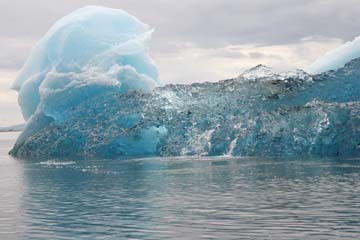 Here is ice that we encountered last year in Tracy Arm. Although not in our best interests to say so, maybe you don't. 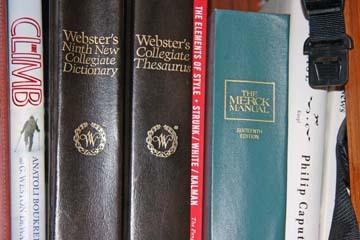 For the hardiest among you, there are alternatives. 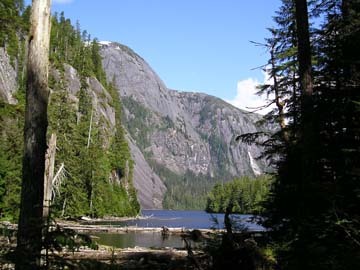 For example, to do Misty Fjords National Monument (also spelled "Misty Fiords"), you could fly to Ketchikan, take a water taxi to a starting point and circumnavigate Revillagigedo Island under your own power, camping in Forest Service cabins along the way. The U.S. Forest Service has posted a step-by-step "how-to" here. 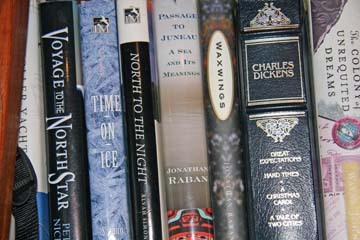 Whether you go on your own or not, there is good information about the trip at that site. For those of you who are unsure about whether you want a mothership, keep in mind that we are biased, but here are our top ten reasons for mothership kayaking. Today's photo: A view from a hiking trail in Misty Fjords National Monument. Today's Photo: Another wonderful hiking trail, discovered via sea kayak.